One of the busier, most attractive and most regular stops on the Inside Passage due to the wondrous site of the waterfalls and migrating salmon viewing. Visitors may anchor on either side of or in front of the falls. From the inlet, visitors can watch salmon leaping in an effort to get through Verney Falls, at the mouth of Kumowdah River. No fishing from July 1 to Oct. 31 inside a line drawn from fishing boundary signs located approx. 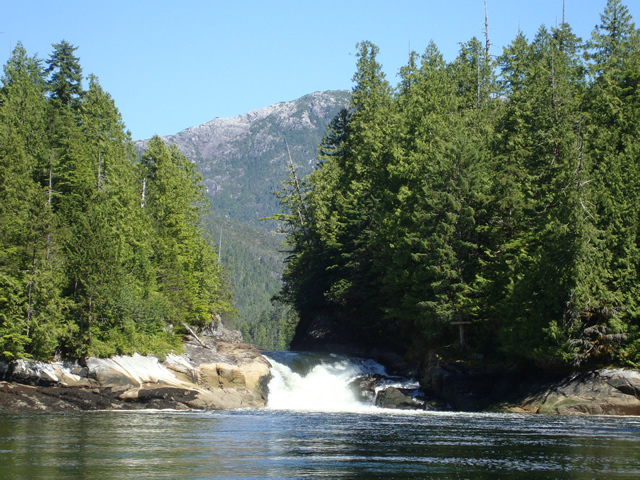 100 m seaward of the falls at the mouth of Kumowdah River, flowing into Lowe Inlet/Nettle Basin. Lowe Inlet is about 22 km north of the bottom end of Grenville Channel, slightly more than 75 km from Butedale. It is 118 km south of Prince Rupert. Only accessible by boat or floatplane. For reference, use marine chart #3946 (Grenville Channel). Cultural Heritage - On the east side of Nettle Basin, the area around Verney Falls, including the trails, is inside a First Nations Reserve (IR #3 Kumowdah). Conservation - Sport fishing is banned (July 1 to Oct. 31) in the lower pool flowing from the Kumowdah River. This area is important to hundreds of spawning salmon. Wildlife - In August, spawning salmon arrive to head up Verney Falls and into Kumowdah River. Following the salmon, seals congregate to feed at the falls. Black bears stand along the falls to catch jumping salmon. The approved Lowe Inlet Marine Provincial Park Management Direction Statement [PDF]. Kayaking can be enjoyed in this area, with landing beaches available. Wilderness / backcountry camping is permitted. Kayak rentals are available in Prince Rupert. Fishing is permitted only in posted areas. Anyone fishing or angling in British Columbia must have an appropriate licence. Excellent tidal water fishing opportunities for salmon and groundfish. Fishing licences are available for purchase in Kitimat and Prince Rupert. Sport fishing is restricted in the lower pool flowing from the Kumowdah River. No fishing from July 1 to Oct. 31 in the lower pool flowing from the Kumowdah River. See “Special Notes” above for more details and refer to current tidal waters fishing regulations. Hunting is permitted in the park during lawful hunting season. Please check the BC Hunting and Trapping Regulations for more information. In August and September, spawning salmon can be seen leaping into Verney Falls to get into Kumowdah River and spawning beds beyond. During this time seals, black bears and eagles can also been seen trying to catch the spawning salmon at the base of the falls. No firewood or firerings are available. If you must make a fire, please keep it minimal, make sure it is extinguished and spread the ashes and rocks about. Wilderness and backcountry camping is allowed, but no facilities are provided. Marine access only.